- What do taxes have in common with conserving bald eagles, gopher tortoises and other wildlife? - What donation option for the Georgia Nongame Wildlife Conservation Fund takes less than 2 seconds but accounts for about 10 percent of contributions? - How can filing your taxes help save rare animals, plants and natural habitats? The answer to all of the above: the “Give Wildlife a Chance” state income tax checkoff. In Georgia, the conservation of nongame wildlife - native animals not legally hunted or fished for - as well as rare plant species and their habitats is supported largely by the Nongame Wildlife Conservation Fund. This fund, set up by law for the work led by DNR’s Nongame Conservation Section, is sustained by public support. The checkoff provided 9 percent of that support in fiscal year 2015. Last question: What can you do? When filling out income tax forms for 2015, don’t consider them finished until you fill in the Georgia Nongame Wildlife Conservation Fund checkoff, line 26 on the long form (Form 500) and line 10 on the short form (500EZ). All donations, large or small, help. - Phone: Nongame Conservation Section offices in Social Circle (770-761-3035), Forsyth (478-994-1438) or Brunswick (912-264-7218). Another golden eagle from middle Georgia is providing insights into these elusive birds of prey. The juvenile male nicknamed Flint was caught, fitted with a transmitter and released Feb. 5 at Devil’s Backbone Hunting Club near the Flint River in Meriwether and Talbot counties. An adult dubbed Devil’s Backbone was trapped at the hunting club last winter and tracked on its migration to Canada and back, a first for Georgia (“Golden find,” Feb. 25, 2015). 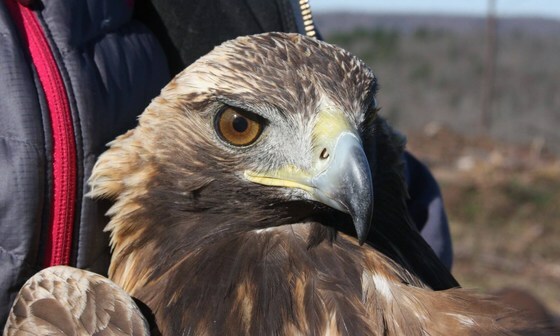 The birds are helping scientists document the migration routes and habitat use of eastern North America’s golden eagles. 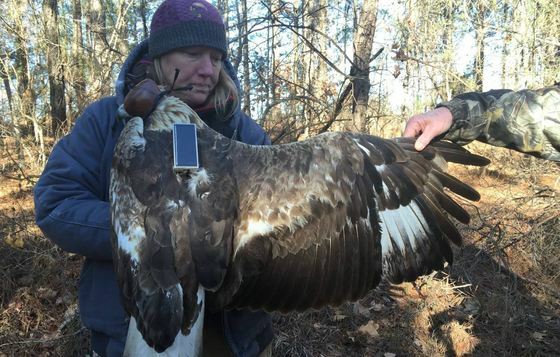 The project led by Dr. Tricia Miller of West Virginia University – and joined in Georgia by DNR's Nongame Conservation Section and the Devil’s Backbone Hunting Club – is monitoring bait-pile cameras in multiple states and tracking about 30 eagles wearing transmitters the size of small smart phones and weighing less than 2.5 ounces. Yet one surprise for biologists and birders alike has been the number of golden eagles documented in Georgia, where they’re far less common than bald eagles. DNR senior wildlife biologist Nathan Klaus said at least five have been photographed this winter at the Devil’s Backbone club, including an eagle fitted with a transmitter last month at Talladega National Forest in Alabama. Goldens are about the same size as bald eagles, but they scavenge less and prey more, usually on medium-sized mammals and birds, but sometimes on larger animals such as foxes and wild turkeys. They’re also more secretive. “They seem to seek out solitude.” Klaus said. While on migration, Devil’s Backbone often appeared to avoid populated areas, he said. Most recently the eagle has been cruising the ridges and forests in and around west Georgia’s rugged Pine Mountain region. After being released, Flint left the area for a few weeks, spending time in the Fall Line sandhills. Now he’s back on the wild ridges of Pine Mountain, where he and fellow eagle Devil’s Backbone will likely spend the winter. - Although the nearly real-time tracking data isn’t available to the public, Devil’s Backbone Hunting Club posts videos and photographs on Facebook. Watch the club’s Jodi Killen release Flint. - In Georgia, the project is powered by partners, including the Devil’s Backbone club, the Nongame Conservation friends group TERN and regional staff with DNR’s Game Management Section, which helped supply dead deer as bait. Dr. Tricia Miller, her husband Michael Lanzone of Cellular Tracking Technologies (the company that makes the tracking devices) and club members trapped Flint on the third morning after two bone-chilling, daylong stakeouts. - Three other camera traps in Georgia, at Piedmont National Wildlife Refuge, on the Chattahoochee National Forest near Dalton and in Baker County, also target golden eagles as part of the project. Read this U.S. Forest Service release about a Feb. 7 sighting. - Because poisoning from eating carrion killed by lead shot is a threat for raptors, the deer and other carcasses provided as bait are free of lead. Each trapped eagle also is tested for lead before a tracking device is attached. Flint’s results indicated he had been exposed to lead, but below the amount at which researchers would be concerned, Miller wrote. - Golden eagles are more common west of the Mississippi River. They’re also found in Mexico, Asia, Europe and northern Africa. South Georgia is renowned for its impressive diversity of native turtles, from venerable landlubbers like box turtles and gopher tortoises to freshwater types like stinkpots and snappers, softshells and cooters. But late winter to spring is the peak period of activity for what is, hands-down, one of the most beautiful and engagingly-patterned species in Georgia’s Coastal Plain – the spotted turtle. These diminutive, bluish-black turtles have small, yellowish spots on the upper shell and orange-yellow spots on the head, a striking array of spots and speckles that look like an artist painted them. The downside to these pleasing characteristics is that they have resulted in the over-collection of spotted turtles for the pet trade, and illegal collection remains a threat. An estimated 1,000 spotted turtles are exported each year from the U.S. The species has experienced a 50-percent decline in three generations, according to the Convention on International Trade in Endangered Species of Wild Fauna and Flora, or CITES. 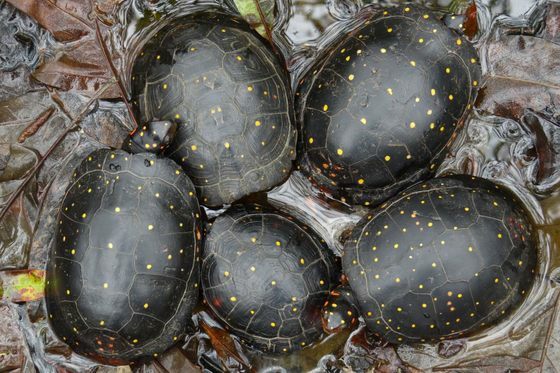 Read Dirk’s blog post to learn more about spotted turtles and what you can do to help conserve one of our most poorly known species! Dirk Stevenson is a wildlife biologist with The Orianne Society, a Georgia-based nonprofit focused on conserving amphibians and reptiles in the wild. “Old yeller” might have a different connotation for DNR biologist and shorebird researcher Tim Keyes. The faded, yellow leg band Keyes found on an American oystercatcher trapped and released last week at Little Sapelo Island marked the bird as originally banded at Little St. Simons Island on Jan. 16, 2001. That means this oystercatcher is at least 16-and-a-half years old. Seventeen is senior status for the species, though end-of-life data is rare and the oldest American oystercatcher on record reached at least 23 years and 10 months. Keyes said details on the longevity of American oystercatchers that use the state’s coast will help conserve the birds. Oystercatchers banded in Georgia in 2001 and 2002 were fitted with three or more color bands and a metal service band. Most of the color bands have since fallen off. While these birds are occasionally seen in the field, the only way to confirm their identity is to catch them and read the metal band code that is unique to each bird. 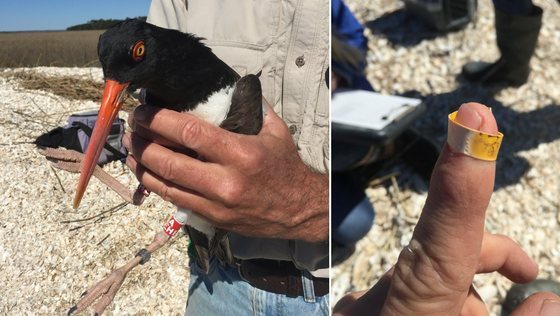 That’s how researchers discovered this bird was caught during the first oystercatcher trapping effort in Georgia. Another Georgia-tagged oystercatcher has been photographed on the Pacific Coast of Honduras, far from where scientists would expect to see it. Of the two American oystercatcher races that breed in North America, the eastern race – along the Atlantic Coast – generally migrates no farther south than Florida’s Gulf Coast, although the “degree of migration (by population) varies with latitude … and breeding birds from South Carolina to Florida are generally non-migratory,” according to the American Oyster Working Group. Still, the western edge of Honduras “is way, way out of where we thought they’d go,” Keyes said. Before, a Georgia-banded oystercatcher had been confirmed no farther afield than the Big Bend area of Florida. This winter, however, four banded oystercatcher from the Atlantic breeding population have been documented in Honduras and Nicaragua. The other three birds were banded in Florida, Virginia and Massachusetts. “There is clearly a need to understand more about the importance of Central America for our wintering oystercatchers,” Keyes said. 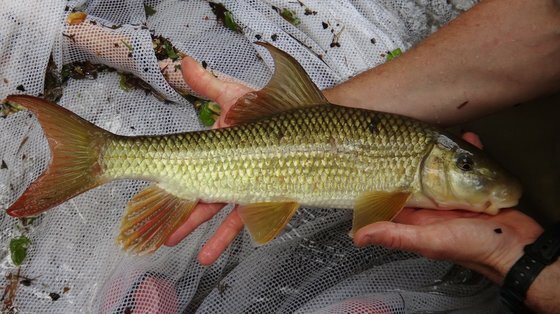 The future of sicklefin redhorse, a fish found in only six Appalachian counties worldwide, is brighter because of a Candidate Conservation Agreement signed Tuesday by power companies, the Eastern Band of Cherokee Indians and federal and state agencies, including DNR. In Georgia, the species named for its sickle-shaped dorsal fin spawns in Brasstown Creek in Towns County. (There are nine redhorse species statewide, all important as prey and indicators of stream health.) The U.S. Fish and Wildlife Service, a partner in the agreement, is weighing whether to include sicklefin redhorse on the federal endangered species list, a decision that will factor in conservation efforts expanded through this week's announcement. Like to draw fish? The 18th annual Wildlife Forever State-Fish Art contest is open to youth in grades K-12, with a deadline of March 31. Deadlines are also drawing near for young artists who want to enter the Give Wildlife a Chance Poster Contest -- sponsored by DNR, State Botanical Garden of Georgia and The Environmental Resources Network -- and DNR's Youth Birding Competition T-shirt Art Contest. The Berry College eagles have two eaglets – one hatched on Valentine’s Day – and pip watch has moved south to the great-horned owl nest streamed at The Landings near Savannah. In Atlanta, peregrine falcons at SunTrust Plaza Tower are exhibiting mating behaviors, with DNR’s camera ready to follow that nest. Tallulah Gorge State Park has temporarily closed its cliffs to rock climbers in anticipation of peregrines nesting on the walls of the northeast Georgia canyon. 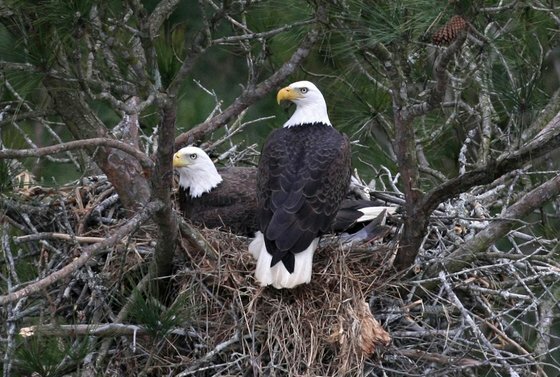 Last year’s nest, from which two young fledged, was the first documented in the state outside of Atlanta in some 80 years ("First wild nest," May 19). 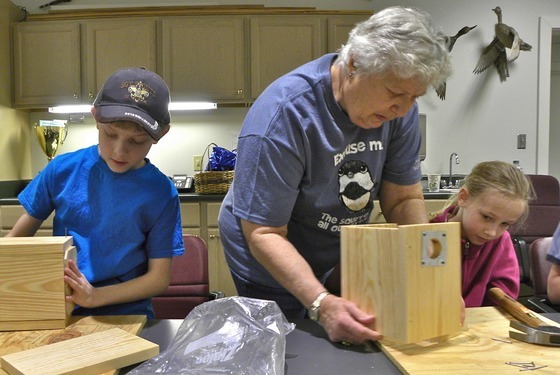 A bird-nesting basics workshop at Charlie Elliott Wildlife Center drew a flock of bird enthusiasts Saturday. The DNR Wildlife Resources Division fosters appreciation, understanding and stewardship of Georgia wildlife through such programs at Charlie Elliott and six other regional education centers across the state. Here’s another way to follow conservation-related legislation in the Georgia General Assembly: Join the Georgia Wildlife Federation’s Camo Coalition. 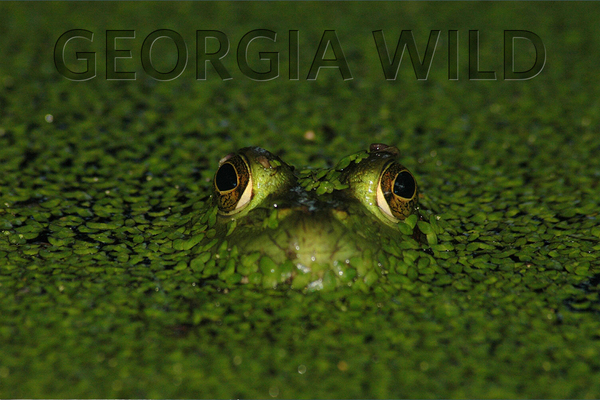 Options noted in the last Georgia Wild included Georgia Conservancy and the Legislature. With leap day coming up Monday – Feb. 29 – what better time to explore Nongame Conservation Section’s work with frogs? Check out the agency’s annual report, the full version or story map overview (also featured in the ESRI story map gallery), and learn more about native frogs through the "Calls of the Wild" CD. More than 100 people attended the fifth annual meeting of the Coastal Georgia Cooperative Invasive Species Management Area last month in Richmond Hill. The full-day symposium coordinated by Nongame Conservation staff and held with the nonprofit Coastal Wildscapes centered on pollinators, with talks varying from native bees to pollinator recovery after removing invasive species. The Mimsie Lanier Center for Native Plant Studies at the State Botanical Garden of Georgia was dedicated Wednesday. Named for garden board member Mimsie Lanier, the center is the focal point for the Athens garden’s native plant restoration, conservation, education, production and safe-guarding work. Athens artist Philip Juras offers a stunning portrait of undeveloped Little St. Simons Island in the new book “The Wild Treasury of Nature” (UGA Press). Juras, whose art focuses on natural landscapes and also made up “The Southern Frontier,” credits Nongame Conservation staff for helping accurately describe Little St. Simon’s natural and cultural history. Upcoming exhibitions. Restoring working longleaf pine and other forests in Georgia and two other states, and improving degraded wetlands in targeted areas of this state, will draw on more than $8 million from the U.S. Agricultural Department’s Natural Resources Conservation Service. The agency recently said the projects, including partner commitments that will more than double contributions, as part of its Regional Conservation Partnership Program. Names in the news: Add a national honor to Bobby Bond’s resume. The DNR Game Management Section wildlife biologist was presented the National Wild Turkey Federation’s Joe Kurz Wildlife Manager of the Year Award, named for the late Game Management Section Chief Joe Kurz, at the federation’s annual convention and sport show in Nashville, Tenn. DNR’s Jarrell “Trip” Colter was part of the engine crew (Engine 610, above) that won the Southern Area Engine Academy Hose Race Championship, part of wildland fire training in Florida last month. 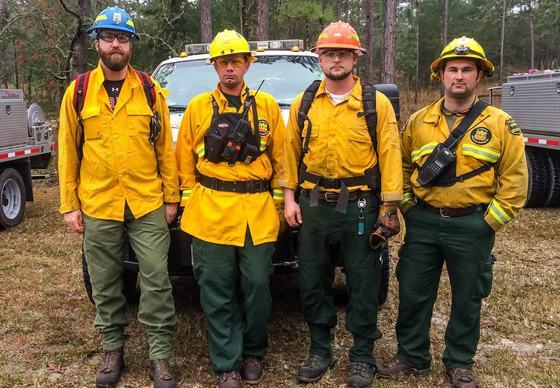 Bryn Pipes, crew leader of the DNR’s seasonal prescribed fire team in southeast Georgia, recently earned prescribed fire manager certification from the Georgia Forestry Commission. Nongame Conservation Section Assistant Chief Mary Pfaffko and botanist Dr. Mincy Moffett teamed with Jennifer Ceska, conservation coordinator of the State Botanical Garden of Georgia, this week to present a webinar on plant conservation and state wildlife action plans to Association of Fish & Wildlife Agencies members. View the presentation. - Prescribed fire season off to hot start. - Bat rescue under a bridge. - How to avoid bird-feeding issues in winter. 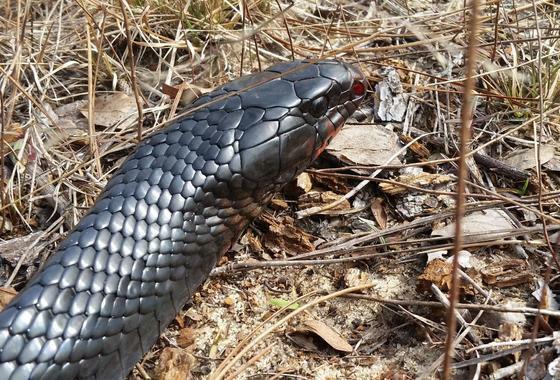 DNR’s Simon Dilts photographed this 6-foot, 8-inch eastern indigo snake recently as it slipped into a gopher tortoise burrow in south-central Georgia. Fellow employee Matthew Moore caught, PIT-tagged and released the male snake as part of a mark-recapture study of indigos, a federally threatened species (details in the Nongame Conservation Section annual report). Dilts also shot this video.